We are extremely proud to announce a new addition to Wildwind British Labradors. Toby was imported from Ireland in 2007. After arriving in the USA, Toby was used as the main pickup dog at one of the largest hunting preserves in the south. 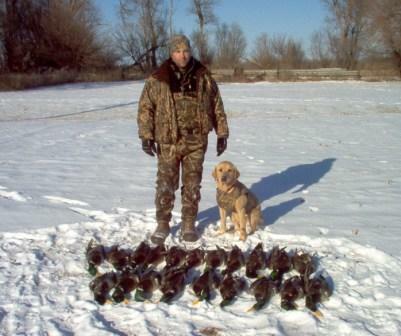 Toby retrieved over 1,500 geese, and 3,500 ducks throughout last season. Recently we were given the opportunity to purchase Toby. It was a pretty easy decision, and we jumped at the chance. A dog of Toby's caliber doesn't come along very often, if ever. We couldn't be happier to have him. Toby's Sire is 3X Int.FTCh Myreton Diablo of Glenloch. Diablo has been one of the top, most consistent Field trial dogs in recent years, and is still going strong. Toby's Dam is out of Int.FTCh Craighorn Bracken. Bracken is one of the top titled yellows ever in the UK. Toby's Grandsire is, FTCh Baildonian Baron of Craighorn "Baron". Baron, at the time of his passing was one of the highest qualified British FTCh's ever. He received 3rd at the 1997 British Retriever Championship. Toby's pedigree includes to many titles and awards to list them all. But, with Diablo, Bracken, and Baron, you know its loaded. Toby's confirmation is excellent, with a very attractive square head, broad chest, and extremely muscular feature's, making him an excellent example of a properly bred British Field lab. Toby is a very well behaved, true gentleman, with a nice thick coat, and the classic "otter tail". His weight is 66 lbs. Toby's drive is as hard on blinds, as it is on marks, over land or water. When he was on the British field trial circuit, he was know as one of the best lining dogs out there in a long time. Its hard to believe that a retriever with this much drive can turn it off when you put him in the truck, or home, but Toby can. Your liable to forget he's there, do to his extremely quiet, calm temperament. A perfect combination. Making him a great companion that is as "Enjoyable in the home, as he is in the field..."
Toby is an excellent game finder, and a pleasure to watch work. 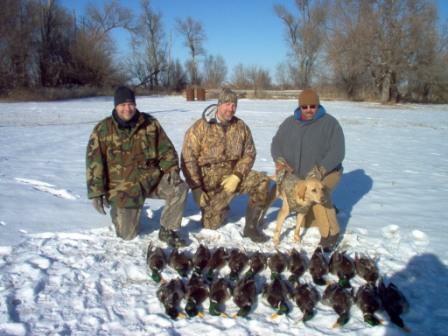 Toby will be hunted extensively on waterfowl, as well as upland game throughout the Fall/Winter. The Spring/Summer, we will be running Toby in hunt tests throughout our area. Toby's parents have both received a Normal/Clear PRA result from Optigen. Meaning, he himself is clear. 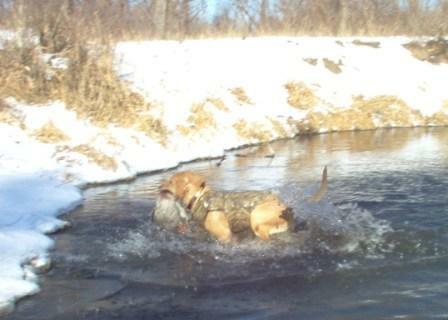 Toby is available for stud services to approved dams.